Finding text based information is quite sensible. Search engines index our information in their search index to help find information easily and match our keywords entered in search box with the information indexed in their search index. But how on earth you can ask a search engine to find information related to an image by providing an image? Even we can't identify information related to an image if we have no idea what is it or where it is from, no? So you can't expect a search engine to help find information regarding an image. Well, now I say it's almost possible on this earth. Yes, Google now let you discover content on the web using an image. I mean, you can start search using an image instead of words. You may familiar with Google Image Search where you can search matching images on the web by entering words. Instead, if you don't know any details about the image you have or seen somewhere, provide the image to Google Image Search and it will comes up with similar matching images and relevant results across the web. Everytime we use a tool or service, we need to know the capabilities and incapabilities to understand how to work with it efficiently. 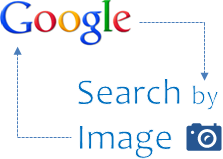 Google indexes images on the web and store in their image index to make use for Search by Image feature. Simply, Google analyze and process images you provide, to understand image patterns to match with images indexed in Google. However you need to understand that Google may not able to provide relevant information for any image. I mean, if you use your recent family photo stored in your computer which never been uploaded online with search by image feature, it will not come up with relevant details as Google has no enough evidence to match on the web. It's obvious, right? But it will show up some similar images and search results. So understand the capabilities and use Search by Image feature to find information related to images. 1. Navigate to Google Image Search. 2. You can initiate search by image by clicking on camera icon on the search bar. 3. You can provide image URL if it's hosted on the web or upload image on your computer for Google Search Image to populate matching results for the image. Note: You can drag and drop image stored in your computer on the search bar to upload and initiate search by image too. 4. Now you will start to see relevant or similar images for the image you have provided, and also it will list out relevant pages that hold information about the image. Oh yes! I love this feature of Google Mayura! Not for anything else but for the fact that I can look up images and see where else on the web are they used. Sometimes I use it to also find out the original source of an image because often there is no link, information or credit given, which makes it difficult for us to link it on our blogs or even use it anywhere. But yes, just as you mentioned, we really can't rely on these images to find relevant content, nor will our personal images that we haven't shared with details on the web, be visible in the searches. Nevertheless, this feature sure does have many other advantages, and I use it often through the chrome widget I have. It's obvious that we can't depend too much on any tool dear :) There could be mismatches, and we can't blame on developers. It's all data and relationships among 'em comes out as results. I do use Chrome extension too :) It's quite easy way to find information about embedded images. I've done that a lot. I love search by image, but this post can be very useful for those who have not thought about it yet. For example, you can search a recipe by image and click on the image that is the most appetizing, but as you're saying that doesn't always meant that the image will be linked to reliable or good content. But images are a good way to be "visible" on the search engines. Thanks for this great info, Mayura! Another excellent post Mayura. Guess you're rewriting the book on Google. ;) This search method can be very useful when you have a copyrighted picture you want to use in your blog, but can't because of the copyright. Now you can use that option to find a similar picture without copyright you can freely use! If I was older I would say "Cool Beans!". I have heard and seen of it a lot, but I have never tried it (the fact is that I never understood how we could do it). The video explains it ;) I guess the next time I need to find the whereabouts of an image, I can just go to google images, upload it and search. LOL... Am I? ;) Ohw... Is there can be same image with the capability of reuse Jan? I didn't notice that. You gotta check it out :) I had some beautiful nature images in my computer and had no idea where are they from or what are the locations of 'em. Once I use 'em with this feature, WOW... just a few seconds and all the information revealed. Now that's just cool. Although I've never actually searching for an image that way before, I mean a particular image but it's really neat knowing that I can. I do use the Google images search a lot though to give me ideas. As always, cool stuff you share here Mayura... Thank you so much. You would love to see how it works dear :) Got an image and you have no idea what it is? Start from it. I've done it for few images to identify locations :) That's really cool to explore and research information through images. As other commenters mentioned, you can use to find original copyright holder or source of the image, recipes etc. I have searched Google images before, but love the way I can drag and drop it. You are such a great teacher! Each time I come to your blog I learn something new. If there was ever a "blog school" You would be the dean! You can search about images and find from where they originated from ;) A great way to find information on the web. Try it out :) You will love it dear. Hmm, I could do that, right? Let me go check it right now (I have a few background pics on my laptop - don't know where it is from). Google analyze your image and find similar patterns on their image index Jeevan :) Of course, binary patterns.